Three children were waiting to board a JCPS bus when a Cadillac Escalade crashed into them. According to WDRB, two of the children were listed in critical condition. The driver was also transported to a nearby hospital and now faces charges for driving without insurance or a registration. If you or your child was injured by a negligent driver, then you may be entitled to compensation for medical bills and other damages. Even if the at-fault driver did not have insurance, you may still have options for recovering compensation. Matt Troutman of the Troutman Law Office is a Louisville personal-injury lawyer who will evaluate your case to determine if you have grounds for a claim. He will gather evidence, assess the police report and doctors’ records, interview witnesses and aggressively represent your interests. Call 502-805-0321 to schedule a free case evaluation. You can also visit USAttorneys.com to learn more about personal injury claims in Kentucky. According to WDRB, the recent pedestrian crash that injured three children happened because the driver did not see the school bus coming to a stop ahead. 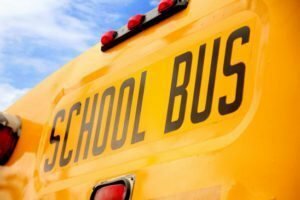 The driver swerved around the bus to avoid a rear-end crash and ended up hitting the children, who were on the sidewalk. 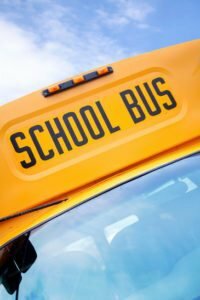 The report did not identify the reason why the driver did not notice the bus, but according to the National Highway Traffic Safety Administration, distractions are primary contributing factors in 26 percent of rear-end accidents. Put Your Phone on Silent: Smartphones contribute to a deplorable number of accidents every year. You might feel comfortable using your phone behind the wheel, but all it takes is a moment’s inattention to cause a fatal crash. Do Not Eat or Drink: Eating and drinking will take your hands off the wheel and focus off the road. Ask Passengers to Help: Ask a passenger to adjust the radio or climate controls so you can focus on the task of driving. Do Not Multitask: No matter how experienced you are behind the wheel, you should never multitask while driving. Limit the Number of Passengers You Carry: There’s a reason why so many states limit the number of passengers that new drivers can carry: Passengers are distracting, so avoid transporting too many people at once. If you were injured by a drunk, distracted or otherwise negligent driver in Kentucky, contact the Troutman Law Office. An accident attorney in Louisville will help you claim compensation for medical expenses, lost wages and non-economic damages. Matt Troutman will help you avoid mistakes such as overlooking certain damages, unknowingly admitting fault to insurance adjusters, or signing a general release. Call to schedule a free case evaluation.